My Sunshine and Shadow Log Cabin Quilt Mosaic is on display at “Farm to Easel” at the Exhibit B Gallery Annual Winter Group Show. 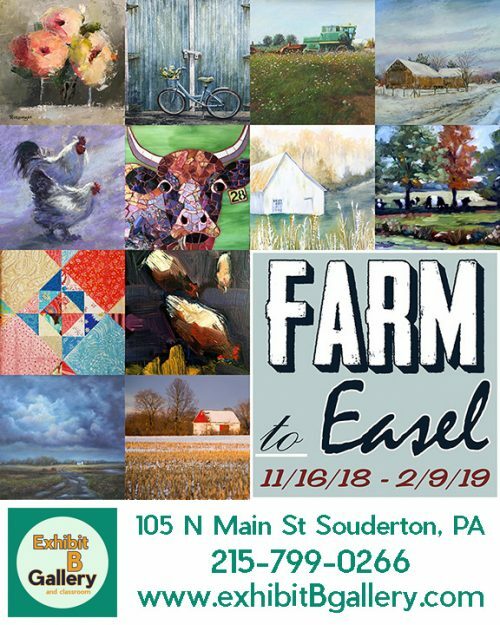 All work includes farm-related subjects from the Pennsylvania landscape to images of quilts, farm animals, the harvested bounty and beyond. 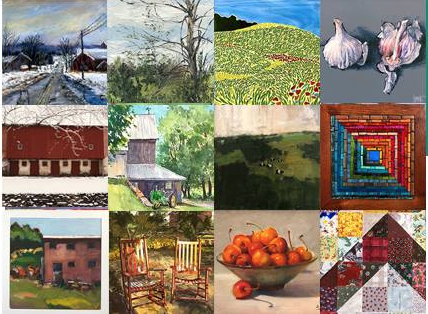 20+ artists and 30+ paintings from artists far and wide. The show continues thru 2/9/19. Exhibit B Gallery: Gallery of art and fine craft in a lovingly restored former 1901 cigar factory. Wonky Patchwork Pendants by Margaret Almon, dichroic glass 2×1 inches. As I get ready for our Third Annual Nutmeg Designs Open Studio and Food Drive for Manna, I am thankful for the generosity of our friends, fans and clients in bringing food donations. Last year visitors brought 450 pounds of food! I have been in the studio putting generosity of color and sparkle into new pendants for the Open Studio. This trio started with some straight lines in the pendant on the right and moved into a bit of wonkiness with the middle and left ones. Quilters have “wonky blocks” with slant lines or askew. Come join us for a generous dose of beauty! Luminous Beauty: Mosaic Word by Nutmeg Designs. Glass on wood, 6.5×12 inches. Nutmeg Designs will be back in Lancaster for the first time since 2009, when we did the previous incarnation of the Pennsylvania Guild November fine craft show. The Artisan Fair, November 11th & 12th 2017, picks up the tradition via the Lancaster Designer Craftsmen, and the sheer beauty of the craft represented will make it a delight to visit and shop. The show is an expo of American-made fine craft and fine art featuring over 100 local and national fine artists and craftspeople, who make functional pottery, handmade jewelry, designer clothing, glass art, woodworking, and more. We will be in booth #153 with mosaics and stained glass. Please stop by! Spooky Nook Complex in Manheim is a state-of-the-art facility boasting easy road access off route 283. 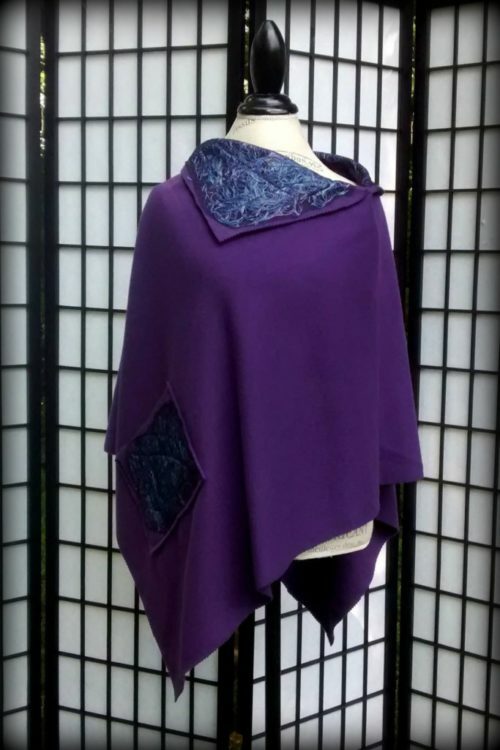 Fashion Designer/Fiber Artist Denise Shardlow has invited Nutmeg Designs to be the feature artist at her Open Studio in Elkins Park. I will be there with mosaic pendants and a selection of other mosaics, and suncatchers by Stratoz. Her studio is an immersion in color with poppy red walls and anyone with an earthy orange living room is a Color Soul Sister! Denise has been busy making capes in a rainbow of colors out of scraps of melton wool. Mark your calendars for Friday Evening August 18th, 2017 from 5:30-9:00. There will be wine from ONE Hope Wine with samples of their wines and a mission to benefit charities. Orange Ombre Domino Pendant by Margaret Almon, glass and millefiori, 1×2 inches, $67. It’s Orange Tuesday with some Orange Ombre in a new pendant shape, the domino. Getting ready for a our 2017 Nutmeg Designs Open Studio: Open Heart prompted me to take on a request from someone at the North Penn Craft Show for a rectangular pendant. If you are in the Lansdale area on May 13th &14th, come by our annual show and food drive for Manna on Main Street. In a bit of added Orange, the goal is to fill the Fit. Edited 5/17/17: We collected over 450 items, which was well over the 300 items from last year. The generosity of our clients, fans and friends was heartening. Open Studio: Open Heart at Nutmeg Designs. Stratoz and I invite you to come to our Nutmeg Designs Open Studio: Open Heart on May 7th and 8th, 2016. Prepare to be delighted, find mosaics and stained glass gifts, and if you bring 5 food items for donation to Manna on Main Street, the opportunity to enter a drawing for a hope stained glass design in your favored colors. Look for the orange chairs on our polychrome porch! 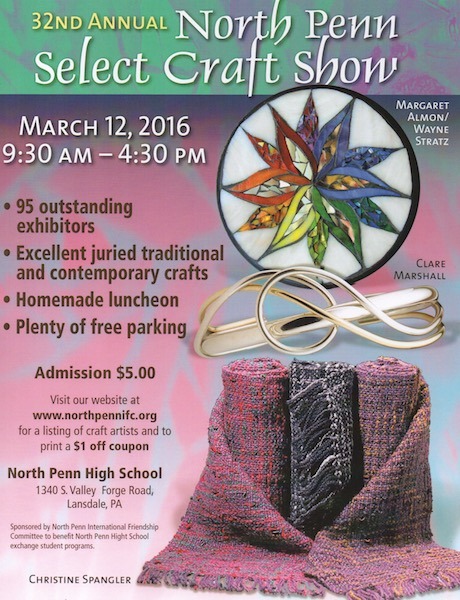 Stratoz and I were excited to have our Rainbow Starflower mandala on the poster for the 2016 Spring North Penn Select Craft Show. Come by booth 98 on March 12, 2016 at North Penn High School. 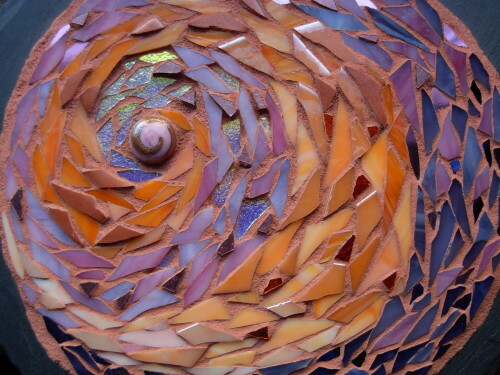 We have been gathering up our mosaic and stained glass, and have color and sparkle to delight you. Copper Gem Bracelet by Cynthia K. Prediger. My friend Cynthia K. Prediger is a talented metalsmith and head of housekeeping at Foulkeways at Gwynedd, and she asked me to participate in the annual Foulkeways Craft Fair sponsored by the Residents Association. Foulkeways was the first continuing care retirement village in Pennsylvania, founded in 1967 by the Gwynedd Friends Meeting, on farmland left to the Quakers by Charles Beaumont in honor of his wife May Foulke. Come to this beautiful setting for mosaic gifts, as well as other handmade items and baked goods. If you are attending the Pennsylvania Guild Show at Montgomery County Community College, stop by before or after on the Saturday, since Foulkeways is just 5 minutes away via Rt. 202 from MCCC. The annual Foulkeways Craft Fair, sponsored by the Foulkeways Residents Association, is being held from 9 a.m. to 2 p.m. Friday, Oct. 19 and Saturday, Oct. 20 in the Foulkeways Auditorium located in the Community Center. Homemade crafts, quilts, holiday ornaments, American Girl Doll clothes, knitted items, baked goods and plants will be available, plus much, much more. Foulkeways is located at 1120 Meetinghouse Road in Gwynedd, PA. You are urged to use the Foulkeways main entrance on Sumneytown Pike. 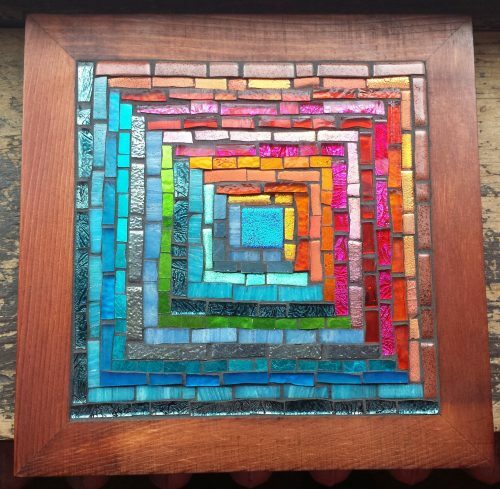 Sunset Mandala by Margaret Almon, stained glass, gold smalti and dichroic on slate, 7 inches. Stratoz and I are gearing up for our next two shows. We are excited to be bringing new work, meet new people, and our fans! Hope in the Desert by Nutmeg Designs, glass on slate, 10×6 inches. Waldorf teachers believe that the human being is not just a brain – but a being with heart and limbs – a being of will and feeling, as well as of intellect… Here the arts and practical skills make their essential contribution, educating not only heart and hand but, in very real ways, the brain as well. If you live in the greater Philadelphia area, come by and feed your heart with beauty! Stratoz and I are especially glad hearted to bring our latest Hope mosaic, Hope in the Desert, a collaboration of our heart and hands. We are in the gym, across from the stage(which is full of delightful crafts made by Waldorf students.) Did I mention the dessert room?